As IT departments’ lists of backlogged application development projects keep growing, so does the speed of new development requests from line-of-business personnel. For many IT departments, the speed of business can’t be met under current practices. This inability to keep pace with critical development requests, supporting timely strategy modifications, seriously impacts an enterprise’s profitability. Given market and economic conditions, the most sensible solution is for IT to empower an enterprise’s business users to support application development, executing a number of tasks in making modifications to applications. More to the point, IT departments should be exploring ways to safely and cost-effectively put application development functionality into the hands of its business user colleagues. 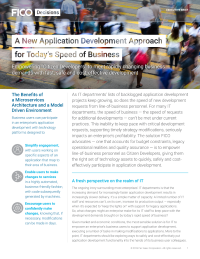 The solution Fico advocates — one that accounts for budget constraints, legacy operational realities and quality assurance — is to empower line-of-business personnel as Citizen Developers, giving them the right set of technology assets to quickly, safely and cost-effectively participate in application development.